I like my new neighbours and I haven’t even met them yet. I can see that we share an affinity for lazy wheelbarrows. Wheelbarrows that lean upright in the garden, half buried in snow. It remains to be seen if their wheelbarrow will get more use than mine, come spring. I somehow feel that it will, since they are new to the neighbourhood and will likely want to impress the rest of us by digging and planting and hauling rocks. I am a bad guest. We were visiting friends in the Eastern Townships on the weekend, and during lunch I could see this scene out window. Cool blue shadows, crisp white snow, side-lit pine trunks against a backdrop of even darker pines. A value sketch formed in my head as I ate. And then, instead of sitting politely while everyone chatted and finished their meal, I set up my paints on the kitchen counter and painted the scene. Rude behaviour indeed. Painted on a pad of Arches Rough 140 lb, 10″ x 14″. It’s been an intense week of grading student projects — for hours and hours and hours on end. It’s the type of work that fries my brain, and all I can think about when I am doing it is that my reward will be an hour in my studio when I’m done. Nothing too ambitious for my tired eyes, just a bit of time enjoying the feel of a sharpened pencil as it travels over the hills and valleys of some soft white Fabriano, followed by the pleasure of dipping into pure colour and watching what it does on the paper. Look what arrived in the mail today! 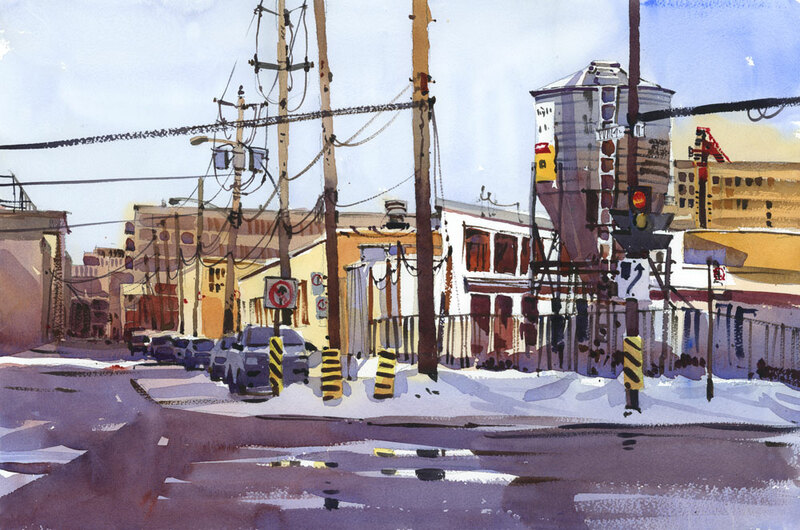 It’s the first copy of my book “The Urban Sketching Handbook: Working with Color“. I was so thrilled to see it in print that I had to get my husband to flip through it for me while I did this video. It’s scheduled to be in the hands of retailers at the end of March, and that’s when pre-orders should arrive too. I am grateful to the many contributors who generously sent me their sketches to be included here. It’s a relief after all the work to see that the colour reproduction is good (especially for a book about colour) and that everything is where it should be. Who doesn’t love a snow day? Especially when you’ve set a 6 a.m. wakeup call for an early class but find out that you can roll over and stay in bed a little longer because all the school are closed. I’ve got plenty of school work to do, but instead started the day with a few sketches using Artgraf watersoluble graphite, the one in the shape of a tailor’s chalk. It was perfect for sketching the monochrome landscape outside my front window. Alice came outside with us while we shovelled our way out of 40 centimetres of snow, but then she was pretty tired and took a nap while I sketched. 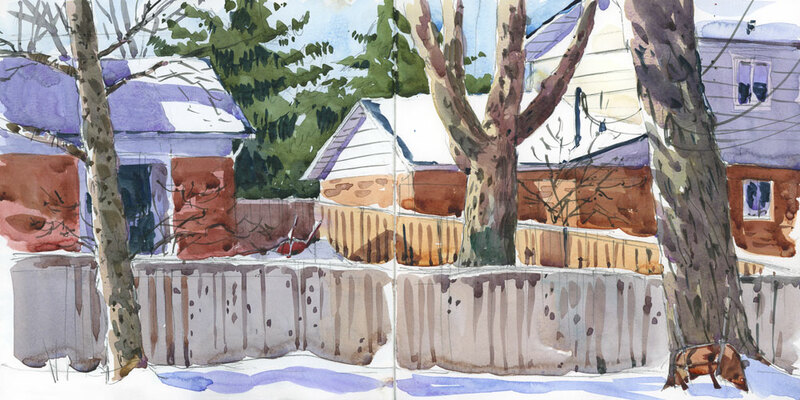 After looking out the front window, I sketched a view of the backyard too. The solid graphite is wonderful for painting values. Since I was going directly to watercolour with no pencil or pen drawing first, I was able to lightly paint the shapes in pale grey and then gradually build up to deep black, with lots of layers of mid-tone greys in between.